I’ve written before about problems with model railroad product documentation, mostly noting that sometimes it’s written by people with good intentions, but who do not really understand how model railroaders will use the product. Well, there’s another problem with model railroading documentation. As your collection of rolling stock and other items grows, you end up with a lot of that documentation. And, it’s not always easy to organize and store that material. Here, we’ll look at one way to deal with the volume of documentation. I once worked a number of years in a large university library and ended up writing a reasonably successful book on organizing photographic collections – an introduction to picture librarianship for those with no library background (see a note about this book at the end of this post). So, people sometimes think I’m an organized person. That’s far from the truth. I’m constantly battling disorganization, but sometimes I’ve learned something along the way. You could actually leave instructions for a particular piece of rolling stock or electronic equipment in the boxes for those items – assuming you keep the boxesand that the item came with a box. But, then, months or years later, when you need to do some work on that item or to replace a part, you end up digging through a huge number of boxes. I think I’ve found a better way. The Germans, being very methodical people, developed standards for all sorts of things in the late 1800s and early 1900s. Other European countries have adopted most of these standards – and some have been adopted internationally. Well, Germans do not just have one standard paper size, they have dozens of them. If you have ever corresponded on paper with someone in Europe or received a printed invoice from Europe, chances are that it’s in the A4 format, which is slightly narrower and slightly longer than the American letter format of 8.5 x 11 inches. Where am I going with this? Well hang in there a little longer. Okay, now that we know about the A5 format, we can also notice is it is fairly close to the American “Memo” paper format – being half of the American letter paper size, or 8.5 x 5.5 inches. Guess what? Just as there are ringbinders for letter-size paper, there are also ringbinders for memo-size paper. And these are the beginning for our system of organizing model railroad documentation. Single A5 sheets sometimes come on thin paper, and the punched holes would easily tear. Thicker A5 booklets may be difficult to fit into a paper punch. 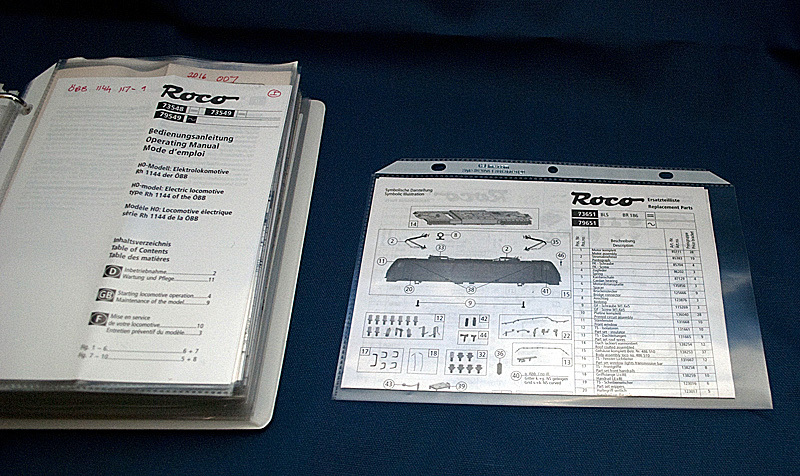 Many of these sheets and booklets do not have adequate blank margins for punching binder holes – and the holes might obliterate some important information. 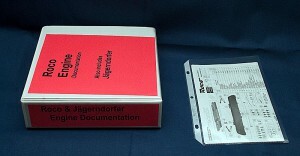 Whether a single sheet, as in the Roco instructions for a freight car at left, or a small booklet, as in the instructions for a Viessmann decoder, the C-Line sheet protectors will help keep both organized and available. Of course, smaller instruction sheets – a real nuisance – will still fit into memo size sheet protectors. And letter-sized or A4 single sheets can be folded in half to fit these sheet protectors. Note: There may well be other companies that make a similar product, which would work in a similar role, but I’ve found C-Line products widely available. The C-Line 62058 is a good medium weight, able to stand up to repeated handling, without being so thick as to reduce the number of these that will fit in a binder. The C-Line sheet protectors come in packages of 50 – and you may as well buy two or three packages to start, as you will go through these quickly. If your local office supply store does not normally have these in stock, they can probably order them. If not, you can buy them on the internet. I’ve bought these from both Amazon.com and eBay when I could not find them locally. Just one shelf of about ten linear feet of my binders of model railroad documentation and notes. These sheet protectors need to go into ringbinders. How many binders you have, what you put in each, and how you organize the contents within them is up to you. Start off with two-inch or thicker binders. They will fill up, and having the thicker binders to begin with will cut down on reorganization. Use binders with clear plastic pockets on the front cover and spine. This lets you customize the binders and easily identify them later. 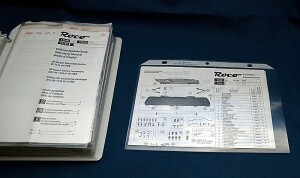 Binders with clear plastic covers let you make your own inserts (on a computer printer) to quickly identify each binder. 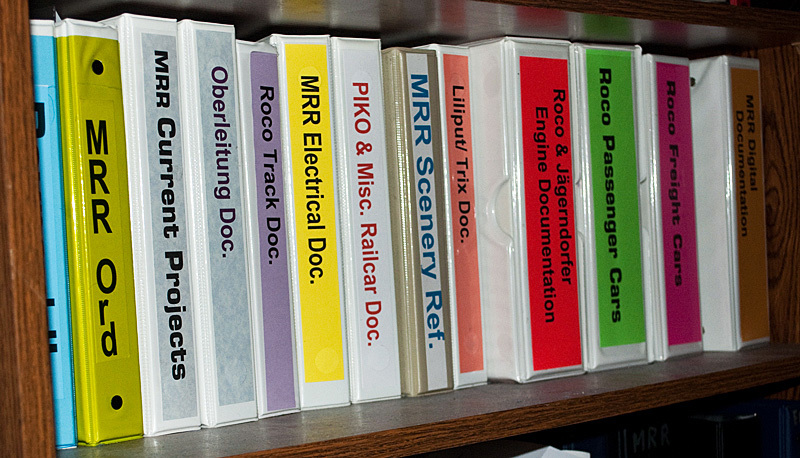 Before I list some of the binders I currently have, I do need to provide some background, including noting that the vast majority of my rolling stock is from Roco. Model Railroad Electrical with documentation for such items as transformers, wiring, etc. Model railroad digital with documentation for decoders, controls, boosters, etc. Scenery Reference with instruction sheets from Woodland Scenics and other manufacturers. Kleinbahn with catalogs and brochures from this Austrian manufacturer, from which I’ve had items for many years. Model Railroad Order with research and notes on products I am interested in possibly purchasing in the future. Layout with tabbed sections for each of the major sections of my planned layout. Notes in each section will record such things as the color coding of wiring in each area. If you buy multiple copies of certain products, such as digital decoders, track turnouts, etc., you will inevitably end up with multiple copies of some documentation. To keep my binders from filling up too quickly, I only file one copy of a particular instruction sheet. However, I do not throw away the extras. I have two boxes, one for duplicate decoder instructions, the other for all other duplicate instructions. 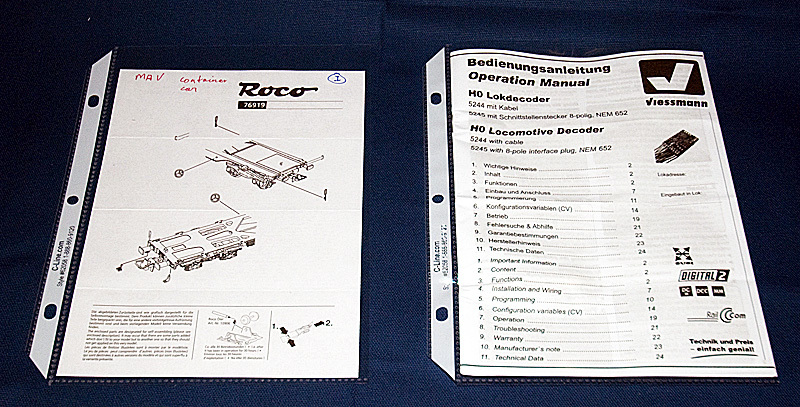 Roco has a very bad habit, particularly for the instructions for freight and passenger cars, of only listing the catalog number at the top of the instruction sheet. And, when the same instructions apply to multiple catalog numbers, Roco lists all of these at the top of a single instruction sheet or folder. So, for rolling stock, I write a brief description of the item at the top of the instruction sheet. (For engines, it’s the full operating number.) If the sheet or folder contains multiple catalog numbers, I circle the one applicable to my model. Finally, in the upper right hand corner of each instruction sheet (or the front page of a folder), I put a circled “I” after I have added the item to the applicable inventory list on my computer. I maintain three different inventory lists, each with a slightly different format for engines, passenger cars, and freight cars. For example, my engine inventory list includes the type of decoder and programmed address. 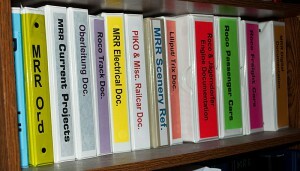 A look into my Roco Engine documentation binder. A closer look shows that the parts list at right is actually an A4 format sheet that has been folded in half to fit the sheet protector. The inventory lists act as an external index to the rolling stock binders, particularly the passenger and freight car ones, which are filed by catalog number. Yes, you can, of course, buy both lined and unlined paper (as well as a variety of pre-printed forms) punched for a memo-size binder. I’ve used such paper for many years. You can even find grid paper in that size. But, I’ve also developed several templates for Microsoft Word, which are based on 8.5 x 5.5 paper. I’ve used these to generate a variety of documents on my computers, such as the inventory lists mentioned later in this post. Some computer printers will accept pre-cut 8.5 x 5.5 inch paper. In other cases, you may need to print your memo-sized page on a full sheet of paper and then trim it down. Of course, it’s also worthwhile to invest in a paper punch so that you can punch sheets of paper to fit the memo-sized binders. A lot of the memo-sized binders and related products in office supply stores are in the personal planner section. (Yes, I’ve used personal planners in that size for many years, too.) But those items tend to be expensive. Even small pads of lined and punched memo-size paper can have ridiculous prices. Instead, look in the regular ring binder and paper sections for very similar binders and paper – both much more reasonably priced. 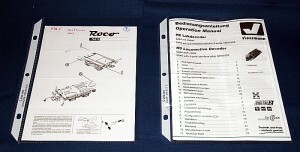 You can also use the smaller binders and sheet protectors to organize tool instructions. The documentation for many tools comes in booklets that are 8.5 x 5.5 inches in size. One major exception to the my above-described system of organizing instructions and other documentation deals with the instructions that come with Kibri and other structure and vehicle kits. These come in a variety of large formats. And, yes I do have some full-size ring binders for items that just will not fit the smaller format binders. Organizing documentation is a journey, rather than a destination. And, as necessary, I add new binders for new categories. My book, Organizing Your Photographs, referenced at the beginning of this post, was produced about 30 years ago and is long out of print. It was produced as personal computers were just becoming widely available and before most photography was done in digital form, so some of the technology discussed in quite dated. Some of the general concepts discussed are, of course, still valid. Used copies still show up from time to time for a few dollars on amazon.com or eBay. Many larger public and university libraries bought copies, so you may also be able to find a copy in one of these – if you are really interested.